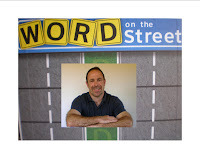 Jack Degnan, inventor of Word on the Street, sits down with OTB to give us the scoop on his life outside the games, and why he cant get enough of game inventing. How long have you been inventing games? I've been inventing games for five years, still a newbie. How many published games have you invented? I have three games published, all within the past two years. What do you do when you are not inventing games? My day job is working in clinical research at UCSD Medical Center in San Diego. I have other hobbies too. I enjoy hiking. I also play the guitar and write music. How did you invent Word on the Street? Word on the Street is a game that I thought of when I first started thinking of designing games. I tried it as a card game. Players would turn over a category card and try spelling words that fit the category using the letters in their hand. When I tested it, I saw some potential, but it was missing something. About a year later, I dusted it off and tried making it a board game: players would race their letters to the end of the board by spelling words that fit the category. But it wasn't interactive enough. Then I got the idea of a tug-of-war of letters across a board. When I researched the name "Tug-of-Words", I saw there was already a game with that name so that's when I came up with the street theme. Do you have any role models whom you look up to? Mhhh. In the board game world, I'd have to say my role model is Keith Meyers - a successful game designer who taught me how to design games. I don't think I'd be doing this if I hadn't taken his class. Outside of the boardgame world, I'd have to say Harvey Milk - a man who worked tirelessly to encourage people to be honest and true to themselves regardless of the consequences. What is the best piece of advice you ever got about inventing games? Why do you think that games are important? Living in the digital age is wonderful for many reasons - but I think it has its drawbacks - and one is that it's causing humans to become more isolated. Board games are interactive. People have fun, laugh, learn, and get to know each other. Those are things we humans are supposed to do. What do you like most about being a game inventor? I love watching people have fun with something I created. There is nothing like that feeling. Who do you typically play games with? My friends and my family. I belong to a couple of board game groups too and those are great. I used to play Scrabble with my Mother a lot; but I think Word on the Street is becoming her new favorite game. I have so many favorite games. There's just not enough time to play them all. How many games are in your personal collection? I just went to count. 38.